Arnold sideways. – Dirty wet dog , boats and sailing. As a digression from sailing i have been talking about caravans in the last few posts. Our man from NZ responded with : “I think the only comment I can make is “does it point” going sideways is really frustrating …..:-) and i have to say yes it is. Nearly everything i thought about caravans and disliked about them i thought i found to be true when i taught a couple aboard the family Macwester and specifically that the boat wouldn’t just not point but it had about the same performance upwind as a square rigged ship and that can mean as low as 60 degrees true wind angle. I realised at the time that it shouldn’t be quite that bad but certainly not up to the standard of boats that i normally sailed so with a bit of work i sorted out some of the major problems and possibly brought that boat up to about a 50 degree true wind angle which is a hell of a major improvement . 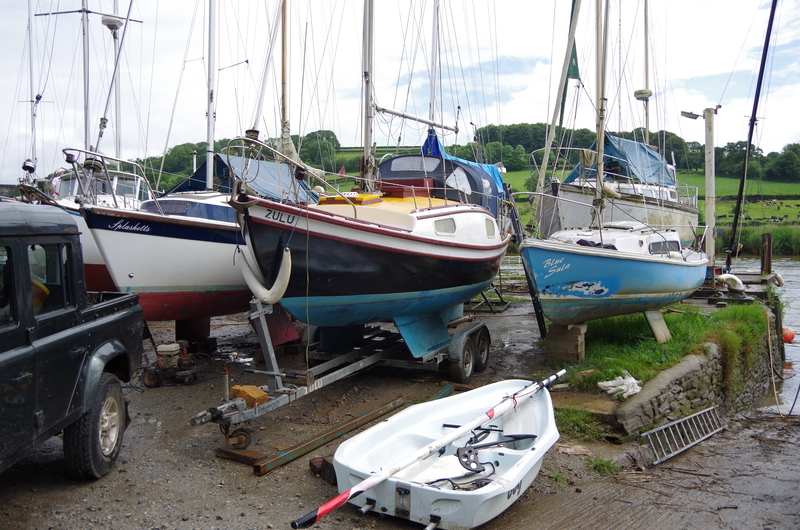 I have been giving Al’s response some thought as i have been pondering the idea of buying one myself and would hate to end up sailing a complete dog so today i have been trying to pick apart the whole windward sailing problem for cruising boats. It seems to me that many cruising boats aren’t good to windward but then neither are many cruising sailors and its a simple observation that many cruising sailors don’t even make the effort to try and sail especially in light or heavy wind but go straight for the motor option as default. Racing sailors of course HAVE to go upwind and many races are either won on the upwind leg or when trying to get dead downwind and once again that is bizzarely when many cruising sailors don’t try and sail either. So i’ve been picking this one apart and here is a semi structured response and i would like to set this as s series of questions that visitors here might wish to comment on and get a discussion going. 1.Why do many cruising boats seem to have poor performance either to windward or dead downwind. 2.Why do so many british cruising sailors often not sail in less-than absolutely ideal conditions. 3.Can we take a poorly performing cruising boat and improve its performance. Question 1 Well where do we start, first rig usually small and designed with poor airflow over the main, if we go as far as roller blind mains well ask Dylan about Flat Eric, we have outsailed 40 ft caravans or as we see down here American down wind bathtubs with LB. Hulls, well did some of the “designers” ever do basic flow analysis I have seen keels with a flat leading edge and I mean flat like a foot wide or a piece of flat steel plate with a lump of lead bolted on the bottom. Fish are the shape they are for a reason. The other thing is in some cases they can’t really be called keels as they are really just extensions of the fat curved shape that form’s the hull, “A little more wetted surface for you sir” lateral resistance whats that ? look at how much interior volume I have. Waterline length mmmm that huge overhang at the bow and sometimes stern and a short dumpy waterline need we say more. Now we get into the weight of the stuff carried on board, how many bicycles do you need ? Jerry cans etc along with multiple solar panels, all either weight in the wrong place or windage. The classic cruising “headroom 35” with multi heads and no pointing ability is the result, one build I was involved with the “look” was far more important than the ability to sail ! hence the winches being mounted at the completely wrong angle for sheet lead. Question 2 Its not just the British that hit the start button, but I can see why if you can’t actually make the thing sail and of course “Gentlemen never sail to windward” that’s what delivery crews are for. Question 3 Maybe, by either selling it and buying a better boat or in extreme cases taking a chain saw to it (you can get carbide tipped chains for fibreglass boats) , it has been done. all of these are like the tearing up of large denomination notes in a cold shower ! As Steve said he made a dog go to windward a lot better with the application of some basic tuning, just remember bendy toys are known as bendy toys for a reason, Now do you want the doors open or closed before we tighten the rig. It reminds me that when i was trying to make the little Mac go to windward i had to keep ducking below to make sure the door through the main bulkhead would still open as i tightenned the rig down : years before i was trying to tune a bendy-toy at the yard and just couldn’t get the rig the stay tight during the process. I did what i could and then the irate owner called us to say that the heads door was jammed….basically the boat was so lightly and badly built that i had been compressing the deck and when we checked the main bulkhead supporting the rig wasn’t directly underneath but some distance aft of it. In a post that i am starting to write i am going to talk about a couple of things together ie the IOR race boat as cruising boat (awful idea) and the problems of compromise in sailboats. It may appear that I hate anything that is not a performance boat but its not the case there are a lot of caravans out there that give their owners lots of fun and good on them, long may they sail sideways.